This year might mark the 400th anniversary of Cervantes’ death – he actually died on the same date as Shakespeare, but actually several days later as Spain had already switched over to the Gregorian calendar – but his work has never been more alive. 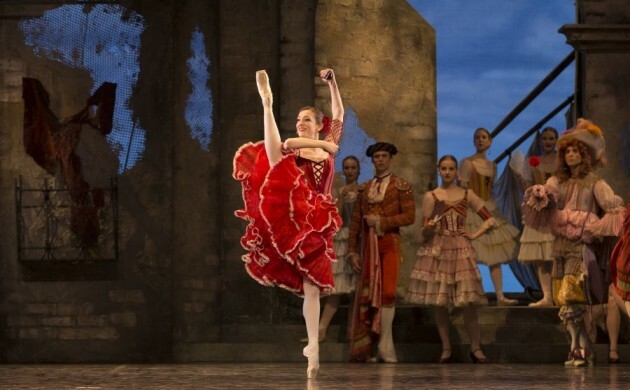 On Saturday 30 April, the Royal Danish Theatre presented the premiere of ‘Don Quixote’, a superb ballet based on episodes taken from the novel ‘Don Quixote de la Mancha’ that was masterfully performed. The ballet was firstly staged in 1869 by the Bolshoi Ballet, to choreography from Marius Petipa and the thrilling music of Ludwig Minkus, and it soon became one of the most renowned classical pieces worldwide. A week last Saturday, the entertaining Spanish themes were brought to the royal ballet stage by choreographer Nikolaj Hübbe, and the performance completely overwhelmed Copenhagen’s audience. The plot of the ballet tells the unsuccessful attempt of a very rich man, Gamache, to marry the beautiful Kitri, who falls in love with Basil, a young man of the village, although their love is thwarted by her father. The first act, ‘A market-place in Barcelona’, immediately reveals the warmth of the southern romance of Kitri and Basil, played by the talented Ida Praetorius and Marcin Kupiñski. The joyful atmosphere in the crowded dancing square is enhanced by the set and the costume design of Jens-Jacob Worsaae. The scenographer provided an appropriate form to display the Hispanic environment within the requirements of classical ballet. The bright composition is made of warm colours and sumptuous costumes. Amongst the most delightful scenes of the entire ballet was the passionate interpretation of Toreador Espada by Gregory Dean, as well as the historically memorable scene of chasing mills, in which Don Quixote mistakes the windmill for a giant. The ballet ends with a splendid pas de deux to celebrate the marriage of the two lovers, Kitri and Basil. The whole ballet was a masterpiece. The dancers performed their characters with mettle and elegance, while the orchestra beautifully played the exciting southern rhythms. The play definitely deserved its standing ovation with several minutes of applause. ¡Felicitaciones!